Welcome to Friday all , today we are going to review CITADEL The Concordant series by Matthew S Cox. Eleven year old Kiera Quinn is sure she’s having a nightmare. She doesn’t believe a nap that started in her suburban bedroom ends in an empty wasteland. She doesn’t believe everyone she’s ever known may have never existed―and she definitely doesn’t believe an old man who tells her she will resurrect the world. The odd shaman clad in junk and old computer parts claims she is ‘the child born of the earth,’ humanity’s only chance to survive. Desperate and scared, Kiera humors him, hoping her bad dream ends soon. Fate has a funny habit of getting in the way of destiny. New parents and a new home―even a super-primitive tribal village―feel like the best place for a child to be, not off saving the world. Adjusting to life without video games isn’t easy, but her new mom and dad give her what her old ones couldn’t: time and attention. 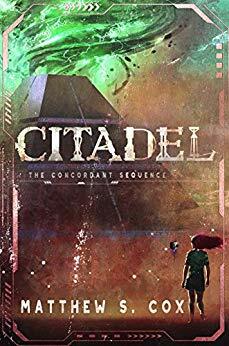 Alas, Kiera’s discovery of a secret within ancient ruins makes the ruler of the Citadel want to kill her. Her only chance is to hope a crazy old man wasn’t so crazy―and that saving her parents won’t destroy the whole planet. What do you do when your whole world is turned upside down . When after a nap in what she thought was her childhood home . Kiera wakes up in a burnt out waste land. thinking she is in a nightmare she makes friends with an old man who thinks she is here to save the world . But fate as other things in mind for miss Kiera and she finds a village that will take her in . A new mother and father that will do anything to protect her. When her family is taken away, Kiera will go on a rescue mission to save them and maybe save the world at the same time. The characters in the novel are very well written and complex. Kiera is your typical 11 year old girl all she wants to do is play video games and hang out with her best friend . She is figuring out that something is wrong when it seems that the days are mixing up and repeating . When thing start to go wrong we see her grow and become a really strong girl . The first part of the book is just a little slow because the author is setting up the adventure for later on. Once we get into the wasteland the author throws curve balls at us over and over . For me I got sucked in and couldn't put it down .I wanted to find out what happened to Kiera and if she got home or did she save the world . To me the funniest part is when she was being flushed . Ok you have to read the book to figure that one out , not going to help you there . This is a great book for those winter nights where you want just get taken away to another world .